AppleWatchEkg from Andrew J. Schuman on Vimeo. 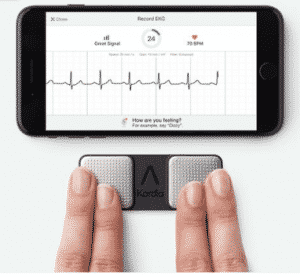 I previously recorded a review of the AliveCor KardiaMobile Device and KardiaBand on Medgizmos. These are FDA cleared for recording an EKG on the Apple Watch series 1 through 4, up to 5 minutes in length which can be interpreted by a cardiologist and transmitted to a patient’s physician. 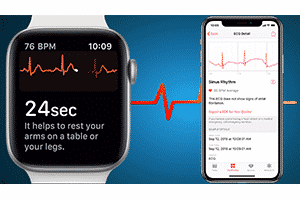 Now Apple has integrated EKG support into its series 4 Apple Watch. The application is free of charge in contrast to the AvliceCor devices and KardiaBand which now sell for $100 each. The Apple EKG is limited to a 30 second recording. It integrates into the Apple Health application and displays the recording upon completion, this can be saved as a pdf file which can be emailed to the patient’s physician. 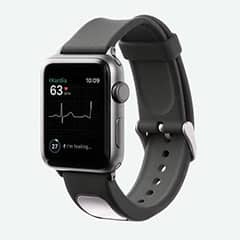 The apple watch apple is very nice because it allows patients to record symptoms that may be associated with the EKG such as fatigue, shortness of breath or palpitations. It even allows patients to activate a 911 emergency call (also demonstrated previously on Medgizmos ). The Apple Watch and associated Apple Health application allows patients to record activity, nutrition and sleep activity. In the future the watch may have the capability to record blood pressure measurements as well as transcutaneous glucose readings and perhaps even pulse oximetry readings. Stay tuned! I continue to be amazed by how versatile smart phones have become and how innovative companies continue to add to our repertoire of “connected” healthcare devices. Such is the case of the D-EYE Portable Retinal Imaging System. Many primary care physicians would benefit from a better way to visualize the retina and optic disc. Our traditional ophthalmoscopes, after all – provide only a limited view of the retina, even when used with the most cooperative patients. 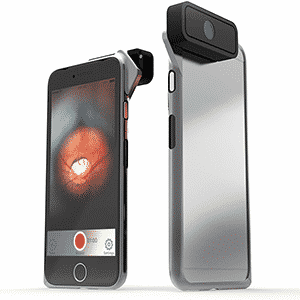 The D-EYE system uses the sophisticated optics of the camera built into many iPhone models in combination with a special attachable lens to provide clinicians with an improved view of the retina. We need to visualize the retina during routine examination and in situations where we follow patients for diabetes or hypertension, and in any patient young or old presenting with headaches, or a history of head trauma. The iPhone is fitted with a bracket that facilitates magnetic attachment of the D-EYE system (see video). Officially priced at $500, I’ve seen the system priced as low as $400. A little bit of training is required to become proficient with the system. Once you learn the application interface and become facile with the device, you will be rewarded with a better view of the retina. 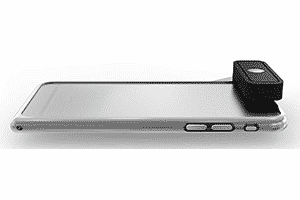 Because android smartphones are not standardized in terms of optics, the D-EYE system is an iPhone only device. One can leave the frame attached to your iPhone during the day and attach the D-EYE quickly when you need to use it. Alternatively you can invest in a used iPhone (easily acquired on the internet for $150) so you equip each exam room with a D-EYE system and keep your own iPhone in the case you prefer. Take a look at the video to see how easy it is to use! Deye from Andrew J. Schuman on Vimeo. One of the best-connected tech devices I’ve reviewed in recent years is the OTO from CellScope. 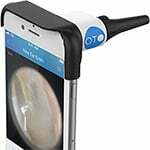 It is an optical attachment that turns your iPhone 5 or 6 (not all models- please see the video) into a full functioning otoscope. It attaches to the iPhone via either a full size or quarter panel adapter depending on the model, and easily snaps in place over the lens of the phone. It uses standard disposable speculums including Welch Allyn speculums. 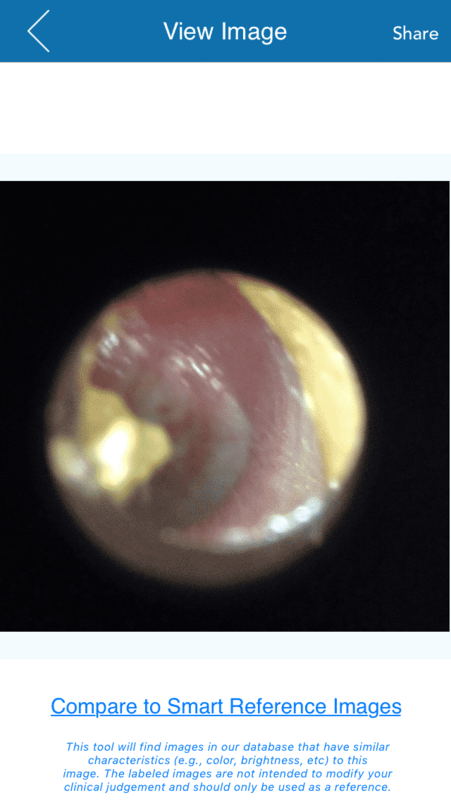 The app enables clinicians to capture images or videos of the eardrum and ear canal, and then share these immediately with patients. This enables you to share your observations with patient and parent. I find that patient and parents appreciate this and they are more likely to take the full course of medication prescribed and follow up if you recommend this. There is a clinical version and a home version. The clinician version comes with an insufflation bulb and an insufflation port. This is helpful in distinguishing a retraction pocket from a hole in the TM. You can copy the images or video into your electronic medical record using the app or a clinician web based portal. It is said that a picture is worth a thousand words. It’s nice to take a picture of a condition – such as a foreign body, or a possible cholesteatoma, and send these to your ENT consultant to get their opinions regarding further care or treatment options. The device sells for $299, but it is well constructed, and gives you capabilities beyond that of a standard clinical otoscope. The Welch Allyn Digital Macroview Otoscope sells for about $1000 and the Firefly Video Otoscope for around $400, so the OTO is reasonably priced. cellscopeOTO from Andrew J. Schuman on Vimeo. Pulse oxime try is recognized as the fifth vital sign – together with temperature, respirations, pulse, temperature and blood pressure, it is routinely obtained at most medical visits. 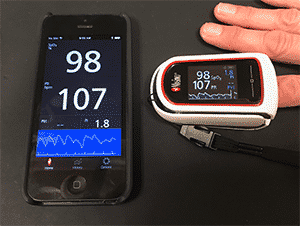 While many stand alone pulse oximeters cost upwards of $1000 or more, there are many lower priced “fingertip” units that can connect via cables or better yet via bluetooth wireless connections to a tablet or smartphone. The Masimo MightySat is a standout that provides accurate readings, shows the pulse, pulse waveform, perfusion index on your smartphone . It features a colored touch screen that will display vertically or horizontally, even when used a finger of either hand. It provides readings in situations of low perfusion or even when a patient is moving or shivering. When the app is loaded on your smart device it finds the MightySat quickly. You can’t beat the price of $300 and available for ios as well as android devices. Keep in mind that while the device can be used for spot readings, it can also be used for continuously monitoring a patient. The bluetooth connectivity reaches distances of 10 to 15 meters or more. This lets you have a poor man’s remote monitoring system at a fraction of the cost. It communicates through walls, around corners, etc. so it is easy to monitor a patient prior to , during and after a nebulizer treatment or in any situation when monitoring the pulse and/or pulse oximeter readings would be useful.